The dance party is set for Thursday, March 3 — and if you want to stay later to see Pride and Prejudice for yourself, well, that’s encouraged too. Our dance card will fill up quickly, so ask us to dance today! 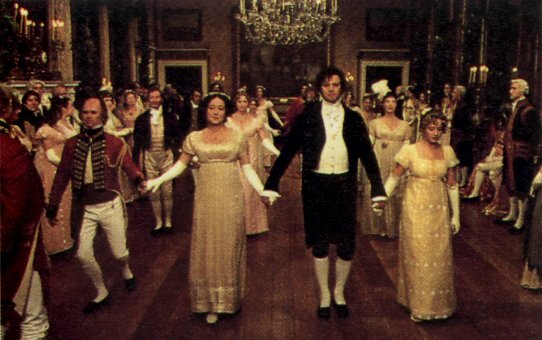 Learn how to dance Regency style with the choreographer from Pride and Prejudice! This is your chance to charm Mr. Bingley, fall in love with Elizabeth, lavish your partner with affections, or scandalously conduct indiscreet conversations with your friends and neighbors. Shocking! Choreographer W. Robert Sherry, an excellent beginner-friendly instructor, will teach the Regency-style dances. No experience necessary and no partners required — the custom in the late 1700s was to change partners frequently — canned music, but it’s better than Mary Bennet on the piano. We suggest comfortable dress and shoes you can move in. Dancing begins at 5:30 p.m. and continues until 6:30 p.m. Stay for drinks and Pride and Prejudice afterwards. Show starts at 7:30 p.m.
To register for Shall We Dance?, the Jane Austen dance party, click here. This entry was posted in Dance, Orlando theater, Regional theater, Uncategorized and tagged Dance, Elizabeth Bennet, Fitzwilliam Darcy, Jane Austen, orlando shakespeare theater, Pride & Prejudice, W. Robert Sherry. Bookmark the permalink. Just had to comment that the 1995 BBC miniseries of Pride and Prejudice was BEAUTIFUL! Yes, it was. I finished rereading the book a couple of days ago and am forcing myself not to watch the miniseries again so I don’t get Pride and Prejudiced out. Looking forward to Orlando Shakespeare’s production in February.